Perhaps the Rev. Monsignor Joseph C. McLoone’s parents might have felt right at home at the first St. Joseph Roman-Catholic Church in Downingtown. They were Irish immigrants from County Donegal, although they raised four offspring in the North Philadelphia neighborhood of Olney, and their third child eventually become a priest and later head of the Chester County parish that now proudly counts itself as the second-largest in the Philadelphia Archdiocese. Monsignor Joseph C. McLoone serves his parishoners. During the 19th century and into the 20th, the parishioners at St. Joseph’s saw their church go through many changes -- from the expansion of the building, to the addition of a rectory, to the taking on of other mission churches. As Italian-Catholics settled into the area, the church clan burgeoned, reaching 250 families by 1931. According to the book accompanying the new church building dedication in 2013, it was in the decade before St. Joseph’s official founding when the Irish-Catholics who settled in the Downingtown area had no formal church to call their own. The faithful would meet in private homes, and missionary clergy from surrounding churches would celebrate Mass when they passed through town. Later, the pastor of St. Agnes Church in West Chester would regularly visit a Downingtown home as a designated “mission parish.” The pastor’s suggestion that a church be built in Downingtown was met with enthusiasm, and the mission parishioners collected $700 toward building the church that would eventually become St. Joseph’s, erected in the Johnsontown section of the borough. In the 1950s, a steeple was installed, an elementary school was built, and a convent was added for the Sisters, Servants of the Immaculate Heart of Mary. A later donation of 82 acres allowed for the construction of a new church on Manor Avenue to accommodate the ever-growing parish rolls, and Christmas Mass was celebrated there in 1971. More students enrolling in school necessitated the building of the Education Center in 1987. In 1999, more classrooms, a gym and the Parish Meeting Center were added. An Archdiocesan nursing home, St. Martha Manor, was opened next to the church in 1989. In 2000, more than 800 families from St. Joseph were among those from other area Catholic churches that the Archdiocese said would form a new church in Upper Uwchlan -- St. Elizabeth. Despite the loss of so many members, the St. Joseph Parish family continued to flourish, and it became more difficult to accommodate everyone who wanted to attend services. After committee meetings, surveys and studies, it was determined that another church building was needed and the idea was supported by the majority of parishioners. Following pledges of $5.3 million, ground was broken for the new building in March 2012. The church, which can seat 1,200, was dedicated June 15, 2013. Part of its design pays homage to the original Johnsontown church by using similar sections, including the entryway, and there are repurposed components from other churches, McLoone said. For example, the stained-glass windows are from Most Blessed Sacrament Church in Southwest Philadelphia, which had closed in 2007. During the 1990s, St. Joseph’s embraced the tenet of stewardship. The monsignor referred to the more than 60 different ministries the church offers -- groups ranging from Good Works Partner Churches, which helps people in need repair their homes, to Hospice Casserole Makers, in which volunteers make casseroles for women and children in crisis, to Joseph’s People, a group that offers support, guidance and counseling for the underemployed and unemployed. Both DiJiacamos have been involved in several ministries. Lou DiJiacamo had been the grand knight of the church’s council of Knights of Columbus, active in the Boy Scout troop and was the head of the Finance Committee. His wife had participated in church study groups. “St. Joseph’s offers people the opportunity to utilize their talents, whether within or outside the parish,” Suzanne DiJiacamo said. One of their children, Becky, is married to Steve Kopec. The Kopecs are also members of St. Joseph Parish and are active in ministries there. The Downingtown couple have three daughters -- Gianna, 9, Maria, 7 and 2-year-old Cecilia -- and have been active with the church since before they were married. They met in 2003 while giving their time to the Youth Ministry. 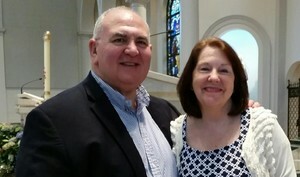 Steve Kopec is a Chicago-area transplant who was looking for a church to join, and Becky had lived in Downingtown from about the age of 3. Monsignor McLoone thinks there are a few reasons for the popularity and warmth of the parish that serves the community of Downingtown, and parts of East Brandywine, West Brandywine, West Bradford, Caln, East Caln, Valley and Thorndale. “I think what’s really helped us is that we’re in a borough. It’s a small town, not just a big suburban parish. It has rowhomes, a firehouse, a mayor and community traditions that go back hundreds of years. “They might live out in Romansville [West Brandywine] or up in Guthriesville [East Brandywine], but they still belong to the parish down in the town. I think it helps shape the picture of the parish family,” he said. The monsignor gave the example of Memorial Day, when after Mass, people travel to the parish cemetery, where they’re greeted by members of the Veterans of Foreign Wars and the Boy Scouts. The church choir sings and there is a ceremony for the veterans who have died. Then they go back and join the holiday parade that goes through Downingtown. “We’re a large part of Downingtown because we’ve been here [for so long],” he said. Most of the parish population is also young, McLoone said. “I know this for a fact … our largest group of parishioners are ages 0 to 12,” he said. “That’s the sign of a healthy parish.” According to the monsignor, St. Joseph’s clergy performed 247 baptisms in 2016. Steve and Eileen Amicone moved to West Bradford in 2001 from North Wales. Although Steve’s job transfer was to Lancaster, Eileen had been to a service at St. Joseph’s and liked the parish, so she wanted to live within its boundaries. The Amicones have six children, and Eileen spent time working at St. Joseph School, handling lunch duty and later as a kindergarten aide. She also worked in the church office. Both she and her husband have been Eucharistic Ministers, taught Pre-Cana and served on the Stewardship Committee. Eileen also sat on the Pastoral Council. “I think this is a great parish. We’re so happy to be here,” Eileen Amicone said. The DiJiacamos said the growth at St. Joseph is apparent during Mass. The acknowledgment of the church’s beginnings in Johnsontown is also important to the present, they said.